Fortnite’s v8.11 patch brought with it the new Flint-Knock pistol. The weapon shoots a single round before reload and has a knock-back effect when shot. The Flint-Knock pistol can be found in floor loot and chests as a “Uncommon” or green weapon. The weapon fires only a single round before having to reload. It mimics the flintlock pistols of 17th and 18th centuries. 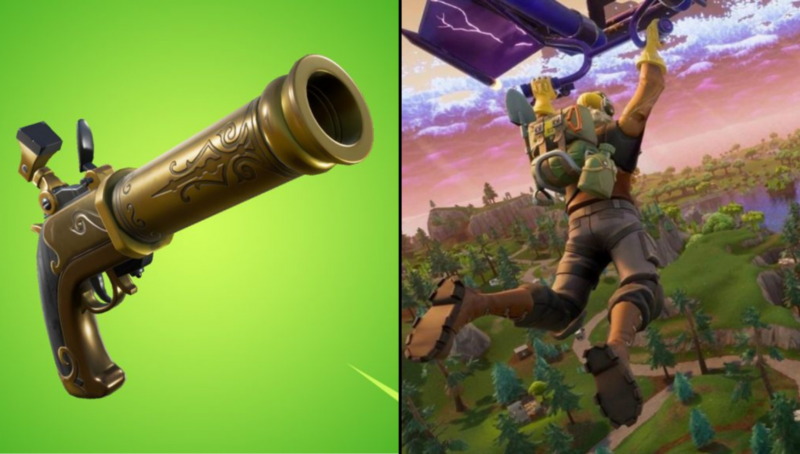 The gunpowder weapon lacks the ingenuity and modern design of other weapons in Fortnite and so lacks any recoil control. The result of this is a heavy knockback effect to the player whenever they decide to let a round go from its barrel. The effect will knock the player only a little while standing on solid ground, but it will send you flying you happen to be on a ledge. Be careful when firing this new weapon when on high…except if you can get a reload in before firing. Players have discovered that the Flint-Knock’s knockback can prevent some or all fall damage. We’ve gone made a short video showing the mechanic at work. The video shows the player taking lethal damage from a high fall, then taking partial damage due to an poorly timed shot, and then taking no damage as the Flint-Knock is fired perfectly. As you can see, the mechanic is not completely simple and will require some practice as timing is key. If you fire too soon, you might still die shortly there after due to enemy fire. A perfectly timing shot will give you a massive advantage in fights. You can quickly descend from a losing battle by simply jumping off the builds. We’re definitely glad to see that timing and mastery is needed rather than a simple “no fall damage” item. We’re sure to see this mechanic being used by Tfue, Nickmercs, Ninja, and others as they compete in the Gauntlet and Blackbeard Cup this week and weekend. It’s now the fastest way to bail from a high up build fight.